ONE of a very handsome pair of silk damask shoes, the prevailing colors being green, yellow, and salmon-pink. The heels, 2 inches high, are of wood and are covered with silk damask. The toes are upturned and extremely pointed; the latchets are broad and show signs of wear from the use of buckles. The total length of the shoes from toe to heel is 9 1/2 inches. Their date is of the reign of George II. In the collection of Mrs. Seymour Lucas. ONE of a pair of lady’s shoes of graceful shape, made of silk brocade, with a pattern of flowers and leaves in various colors, pink, blue, green and gold. The latchets are wide, and were intended to be fastened across the instep flaps with buckles. The heels, covered with brocade, are 2 3/4 inches high, and the toes are extremely pointed. The property of Mrs. C. M. Prickett. 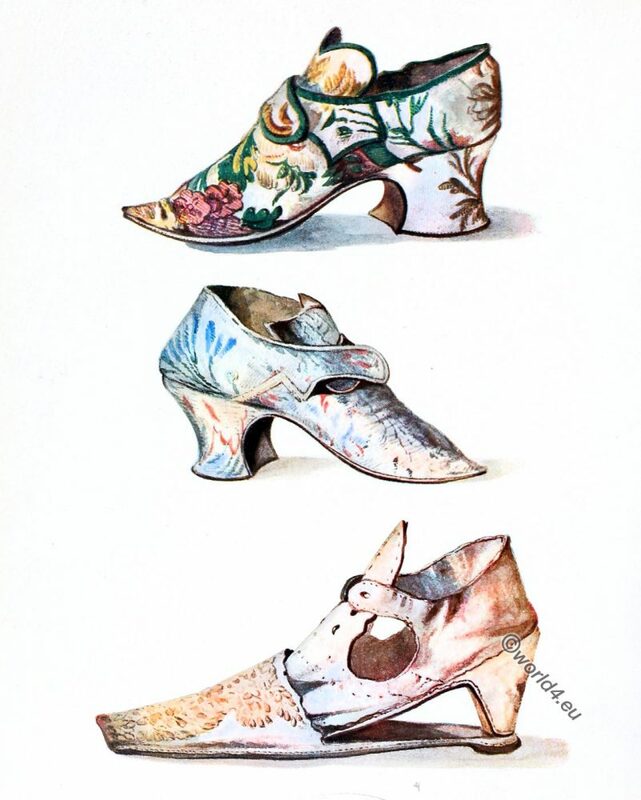 ONE of a pair of very elegant shoes and clogs combined, known also as double-soled shoes, made of white kid leather, which appears to have been covered with cream silk damask. The insteps and toes richly embroidered with pale pink or salmon-colored silk are powdered with seed pearls; the heels retain traces of pink brocade; the latchets are made for tying, and seem from the fragments remaining to have had a fringe and ruching of pearly grey silk, which divided the shoe across the instep, while below the latchets on the instep Rap four holes are punched at regular distances probably as a means of affixing a rosette or bow of ribbon. The heels taper downwards and are 2 1/2 inches high, gaining an additional 1/2 inch by the thickness of the flat heel of the clog, which with the sole, also flat, is of brown leather. The toes, measuring 1 1/2 inches across, are flat and square. The total length of the clogs is 10 1/2 inches, the heels being 1 3/4 inches wide; though the colors of the brocade are faded, the shoes in other respects are in good condition. Examples of these combined shoes and clogs are to be found in Van Dyck’s portrait pictures. A similar shoe is in the museum at Northampton, and the Cluny Museum, Paris, has also a specimen of this peculiar foot-gear. Their date is probably of the first half of the 17th century. In the collection of Mrs. Seymour Lucas.